Regarding the murder, the first thing that comes to mind once you go beyond the obvious brutal nature of it with all the hallmarks of an Illuminati hit, is the incredibly stupid motive behind it. Ask yourself why would a brilliant highly successful military officer kill someone in cold blood for $2000? This story is fascinating in that the unskilled self-appointed investigators look only at the most conventional of explanations for such a heinous crime. This is a huge problem and why the slow minded members of the population are so easy to deceive about the existence of the Secret Space Program. As Einstein said, the real measure of intelligence is the limits of one’s imagination. They, those who don’t believe in conspiracies and who are in denial about the existence of visiting alien races, chemtrails, ufos, and state-sponsored terrorism also known as false flags, have little imagination. What we really have here is a serious lack of insight, one might even say real evidence of a lack of intelligence. It might as well be a different timeline for those of us who see a completely different reality beyond the matrix. Strangely, Moore is a channeler but ask him whether there is a conventional or more diabolical explanation for the voices and visions he has such as mind control and voice to skull technology and he will tell you no, it’s interdimensional and otherworldly. So what is Dolan’s problem? A man who should not be so easy to deceive yet who has chosen the conventional over the deeper and more provocative explanation involving the secret space program, a coverup and evidence for the involvement of a satanic state-sponsored psi-op for the murder? Rich is not the man that I once knew. What was once a fiery rebel working to expose the secrecy and revealing the role of national security as the proof of the coverup of ufos in our skies, has now become an apologist for the state, hiding behind a false front masquerading as the voice of paternalistic “reason”. He has settled for only the most conventional and superficial of explanations for a crime that implicates a top whistleblower who has for the past five years been at the cutting edge of our sector, revealing the very guts of the real truth behind the very craft Rich was so fascinated by as a young man. And yet strangely, it appears that RD never asks himself the question, can evidence be faked? Who benefits from reexamining a murder said to be masterminded by the very man, who if he’s telling the truth, would reveal once and for all the reality of the existence of the secret space program? A man who because of his grasp of all aspects of the subject matter makes him such a truly masterful opponent to the rule by secrecy. Surely one must ask why this attack comes at this time of such great conflict between the two world views, when the fate of humanity stands in the balance. Where we risk falling further down a path of de-evolution and unraveling while at the same time we are on the verge of an awakening so massive it will virtually change the way man sees himself and the nature of reality so profoundly that nothing will ever be the same? Why would RD settle for the most conventional of explanations for why an extraordinary man who is, in essence, a political prisoner in the war of worlds being fought here on Earth and in our skies would even bother to commit such a heinous crime for the paltry sum of $2000? All of this defies logic. Ask yourself what the government of the U.S. has to lose if Mark Richards goes free. Ask what they are so afraid of, that they would go to such lengths to further discredit a man who at this late juncture has already spent over 30 years in prison? And, what is the real motivation for a psi-op aimed at discrediting one of the top journalists investigating the secret space program on the Planet? Who gains? Who loses? And what is motivating someone like RD at this time in his career to join in an effort to assist in the coverup of the very topic he has worked his entire life to reveal? What a coup for the dark side to have recruited this man who once challenged them on every level for their lies and hypocrisy to suddenly join their ranks in pretending that there are no other explanations for this terrible crime than to attack a top whistleblower and officer in the Secret Space Program as being “evil” and “dangerous”? And why, rather than look deeper into why the state would be well motivated to stop the growing popularity of the Mark Richards disclosures, RD (and others) choose to unquestioningly accept the evidence presented by a man who has no background investigating crimes and little knowledge of the rule by secrecy? Do you not find it the least bit suspicious that in the process RD and Moore are working so hard to discredit me, a journalist who routinely reveals the real truth behind so many of life’s mysteries? (This article is written in direct response to this video vlog by Kevin Moore containing an excerpt from his documentary with an interview with Rich Dolan). (My conclusions about the murder are based on the expert investigation of Federal, State and County records by Paul Collin, former CIA NOC (who received a burn notice) and details are linked here). Hoover was raped at a young age… it’s in the records… Perhaps a motive more compelling than $2000? Indications are Andrew was a planted intel agent spurring on the proceedings and making sure Mark got framed. Hoover was their MK-ULTRA Manchurian candidate triggered to perform the murder. Channeler and radio talk show host Kevin Moore from The Kevin Moore show (a radio show in the UK) has decided to film a documentary attacking Captain Mark Richards, and attempting to further implicate him in a murder he did not commit. Mark Richards is an important whistleblower who I have interviewed 9 times over the past 5 years. All interviews are linked below and available FREE on my website and Youtube Channel. At the same time in several recent videos, Kevin Moore is now attacking me and attempting to discredit my work of 13 years investigating and revealing the truth behind the Matrix and the Secret Space Program. He is also using clips of my work without permission, which he claims is not a violation of copyright and slandering me in the process. I researched the evidence surrounding the murder several years ago before I started Project Camelot and got the immediate sense that Mark was telling the truth and that he was being framed. I have never found reason to doubt my initial conclusions. 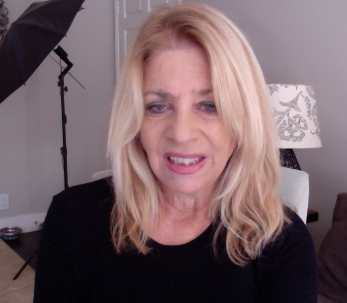 In fact, over the many years working as an investigative reporter, interviewing hundreds of witnesses, many from above top secret and publishing nearly 700 video interviews, doing 5 years of radio, I have come to the conclusion that no one on the circuit today has revealed the depth and shocking truth that comes close to that disclosed by Mark Richards. Up to now, the fact that he has been in prison for over 30 years, gave him a unique freedom from censorship and threats that normally plague most whistleblowers. It is significant that no doubt because of my effort to publicize his vital disclosures there is now a concerted and calculated effort to shut him up and discredit me and my work. In the time spent interviewing both Jo Ann Richards and Captain Mark Richards I have been repeatedly impressed by their honesty and integrity and the depth of sacrifice they have made in dedication to the truth and cause of freedom for humanity against great odds. 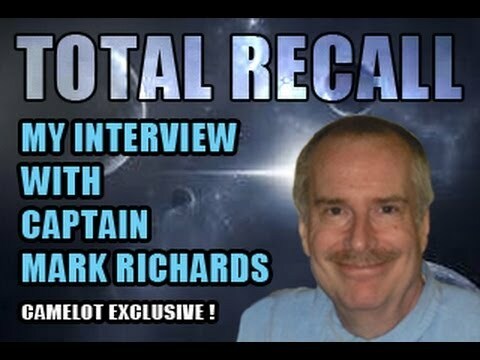 After spending hours interviewing Captain Mark Richards I can say my view of him as a brilliant, caring and profoundly awakened soul as well as honorable man has only increased. I have refused to appear in Kevin Moore’s documentary and it seems that he is greatly disappointed about that. I see this documentary as an attack (backed by intelligence agencies) on Mark Richards and real disclosure of the secret space program. Moore’s attacks on Mark now seemed aimed more predominantly on me and my work. Interesting. It is also significant that Moore will not be interviewing Mark Richards or Jo Ann Richards who have both been advised by their lawyer not to appear. Mark has been in prison for over 30 years. He was charged with supposedly having “masterminded” a murder committed by others. He is currently serving time in the Solano State Prison in Vacaville, California. Kevin Moore interviewed me a while back and says in this interview he started out with a negative view of me (and presumably my work) and ended the interview completely changing his views. Linked below. Several months later he has decided to pursue a documentary favoring the story of the actual killers involved in the murder that Mark is said to have “masterminded”. Kevin Moore claims at this time that he has “new evidence” that implicates Mark. For what it is worth, Mark Richards has been called a “political prisoner” by the well-known physicist, Jack Sarfatti, who is an advisor to the Trump administration. What exactly does Kevin Morre hope to gain by his attack which is most likely triggered by a British psi-op (with help from the U.S.) aimed at further discrediting Mark Richards and a clear attempt to attack and discredit me, Project Camelot and my years of work? He is certainly not working for the light. Punishment of Captain Mark Richards, for a crime he did not commit, has already happened regardless of what you believe about the case. This and subsequent attacks by Kevin Moore and threats made against me by his partner in the documentary (Geoff Reed) (posted below) indicate an effort to use publicity gained from such to boost their potential audience. Further information reveals that the top Illuminati fear the release of Mark Richards would constitute a real threat to their hold over the governments of the world and the NWO. Gaining notoriety and the attention of my audience (now over 61 million viewers with 227,000+ subscribers on Youtube). Seeking to discredit and further disinfo the reality of the Secret Space Program. A targeted hit aimed at discrediting me and my work. Isn’t it funny how often the so-called lightworkers are used to serve a dark agenda? In my view, Mark Richards has given a profound service to humanity via his interviews with me. This includes the disclosures made on his behalf by his wife Jo Ann Richards, a respected speaker on the truth circuit and via his many writings located on the Earth Defense Headquarters website: edhca.org/ He is very likely the best whistleblower out there in revealing the real truth behind the Secret Space Program and what is really going on. Is it any wonder that this orchestrated attack would come just as he is in the process of filing for a commuted sentence? We know for example that one of the actual murderers, Hoover, has now been granted parole (after previous denials) at the same time that he has given Kevin Moore an interview apparently trying to further implicate Mark in the murder. A murder that happened nearly 40 years ago. Update: As of March 10, 2019 that ruling has again been overturned and Hoover is not being granted parole. This is no coincidence. Based on my back channel information, this is an orchestrated attack backed by Briitish intelligence with connections to a U.S. intelligence agency. We are now investigating this further and more will be revealed in the coming days. Captain Mark Richards is actually an American hero and so was his father Ellis Lloyd Richards also known as “the Dutchman”. Mark Richards and his father were involved with top-level military intelligence operations since World War II. They were part of the team who invaded the alien run Dulce Base notoriously known as a jointly-operated human and alien underground facility that still exists under Archuleta Mesa. Dulce is a place where humans have been kept underground in cages and experimented on. The real story about Dulce has yet to be exposed in the mainstream media. For more on Dulce see Phil Schneider linked below. Mark Richards spent many years as a Captain of a “starship enterprise” type vehicle, part of the Orion class vehicles owned by the Secret Space Program. Clearly this man knows too much and those in positions of power will stop at nothing to keep him locked up. To educate yourself on the truth behind the story watch my interviews with Mark linked below, which includes the interview with Ph.D. Chemist Julian Salt who has checked out many of Mark’s claims and found them to be true, and my interviews with his wife Jo Ann Richards. To the various personalities Kevin Moore has recruited to help in his attacks on me, Jo Ann Richards and Mark Richards, be aware that being convinced by planted evidence is nothing new. You do yourselves and the truth movement a great disservice in falling for what is so obviously an Illuminati hit aimed at what is one of our best disclosure witnesses out there today. The dark magicians must be rejoicing over their latest followers to their dark cause: the further enslavement of the human race. 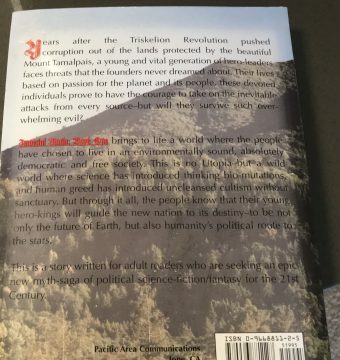 …”Years after the Triskelion Revolution pushed corruption out of the lands protected by the beautiful Mount Tamalpais, a young and vital generation of hero-leaders faces threats that the founders never dreamed about. Their lives based on passion for the planet and its people, these devoted individuals prove to have the courage to take on the inevitable attacks from every source–but will they survive such overwhelming evil? IMPERIAL MARIN BOOK ONE brings to life a world where the people have chosen to live in an environmentally sound absolutely democratic and free society. This is no Utopia–but a wild world where science has introduced uncleansed cultism without sanctuary. But through it all, the people know that their young hero-kings will guide the new nation to its destiny–to be not only the future on Earth, but also humanity’s political route to the stars. Kevin Moore interviews Kerry Cassidy all about the secret space program, whistleblower testimony and more…. 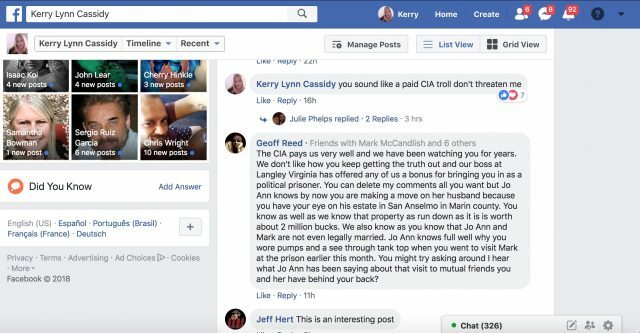 GEOFF REED (KEVIN MOORE’S PARTNER IN THE DOCUMENTARY THREATENS ME ON FACEBOOK.